Listen carefully the next time you walk by a creek, river or stream and you may just hear the splash of salmon running upstream. That’s because every fall, salmon leave the cold waters of the Great Lakes. They spend spend most of the year in the lake, and then return to tributary streams to spawn. In late summer and early fall, they can be found gathering at the mouth of rivers before starting their journey upstream. The salmon you’re likely to find in local waters are chinook salmon, the largest of the Pacific salmon species. Chinook salmon during a salmon run in the Humber River. During a salmon run, female chinook salmon will dig broad, shallow nests or redds into the gravel, choosing to lay their eggs in areas where there is fast-flowing, fairly deep waters. The timing of their egg deposition is to ensure that their young will emerge during an appropriate season for survival and growth. For female chinook salmon, they will guard their redd between 4 to 25 days before dying. The eggs will hatch after a total of 90 to 150 days depending on water temperature. The average number of eggs laid by a single female is almost 5,000! These eggs may be spread across several nests. So what makes the story of the chinook salmon run interesting? For starters, despite their numbers, chinook salmon are not actually native to the Highland Creek and Great Lakes region. Up until the late 19th century, you would more commonly find native Atlantic Salmon, but due to unsustainable fishing practices, alterations to the river courses, the blocking of migratory passages, and habitat loss and degradation, these fish eventually became locally extinct (or extirpated) from the watershed. 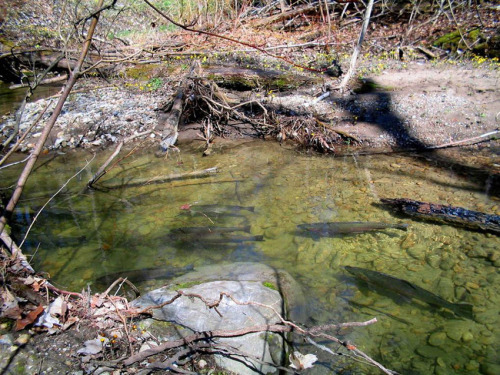 As a top predator species in Lake Ontario, the loss of the Atlantic Salmon from Highland Creek left a gap in the food chain. Chinook salmon were introduced into the Great Lakes as far back as the 1870s, but more recently they were stocked to control the invasive alewives population, which exploded after the decline of their main predator, the lake trout. Recent years have also seen renewed and significant efforts to bring back Atlantic salmon to Lake Ontario. Since 2006, a coalition of more than 40 partners have been undertaking the Lake Ontario Atlantic Salmon Restoration Program with the goal of a vibrant and self-sustaining Atlantic Salmon fish population in Lake Ontario and its tributaries. 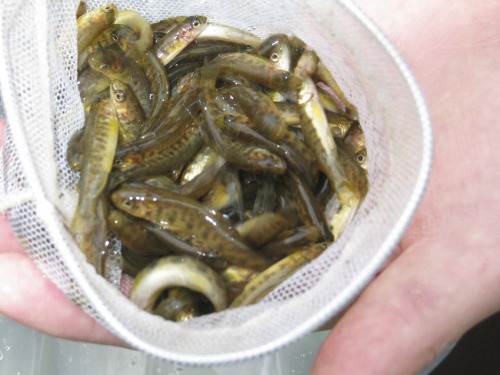 Restocking of Atlantic salmon fry. 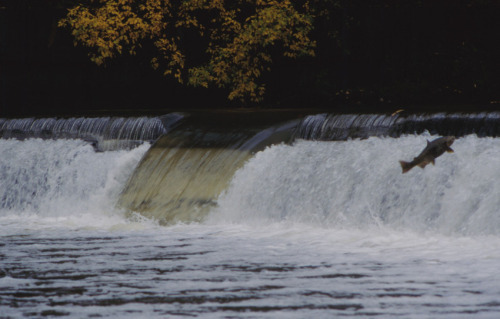 Salmon runs occur in all of Ontario’s Great Lakes and take place in early September to November when temperatures are between 3°C to 10°C. The natural history of salmon in Lake Ontario and Highland Creek is a complicated and interesting story. To celebrate the remarkable journey of the chinook salmon and learn about the unique history and importance of protecting our local ecosystem, come join us on September 30 for the 9th Annual Salmon Festival at Highland Creek!